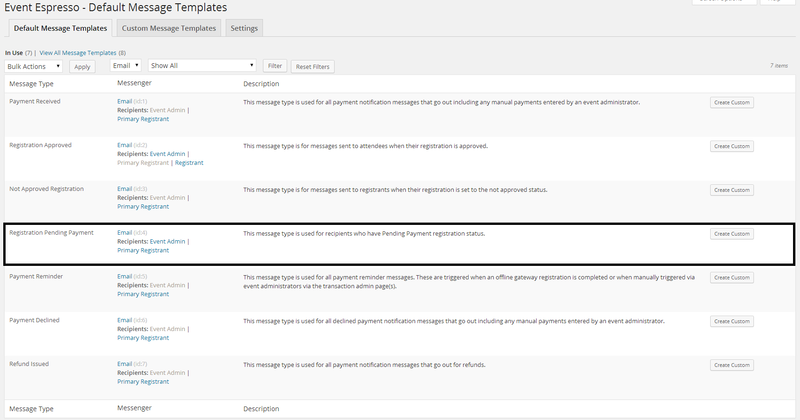 A single message type may have different content depending on the context in which that message is used, for example the content of the ‘Registration Approved’ message you send to the Event Admin will likely be very different from the content used for that same message sent to the Registrant(s). The Event Admin may need to know there is x amount of new registrations within the email, but that may be all that they need to know. The Registrant(s) on the other hand may need directions, special instructions, an overview of the registration etc all of which do not need to be included within the Event Admin message. So although the message type is the same, those two messages are very different. When editing your message templates, its important to keep these contexts in mind and ensure you edit the correct one for the intended recipient. Here we will show you how to edit the default ‘Registration Pending Payment’ message in the ‘Primary Registrant’ context. Go to Event Espresso -> Messages. Under ‘Recipients’ we can see that the Event Admin and Primary Registrant contexts are active. We want to edit the message sent to the Primary Registrant as they will handle all payments, so we click on the ‘Primary Registrant’ link. 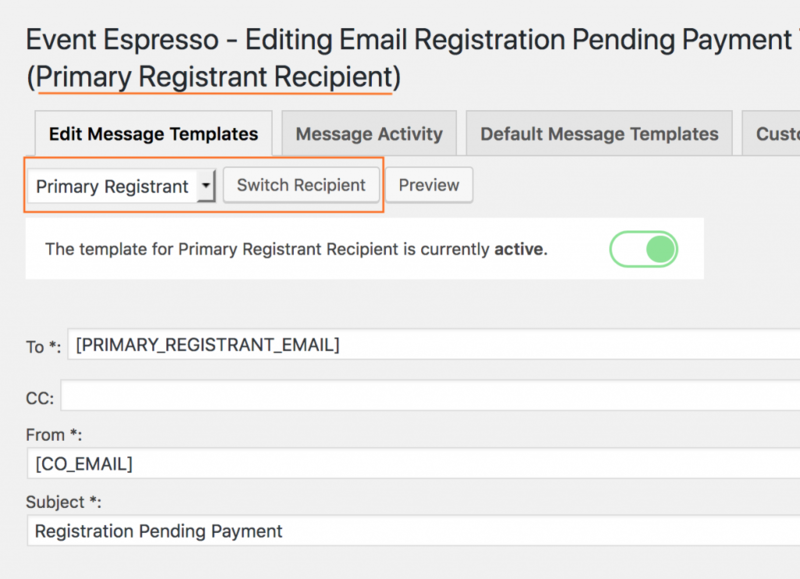 Notice we can see our context within the title (underlined) and we can also switch between any context available within that message type using the drop-down to select the context and pressing the ‘Switch Recipient’ button. We can see this message is to be sent to the [PRIMARY_REGISTRANT_EMAIL] from [CO_EMAIL] (which is the email address set as your Primary Contact Email within Event Espresso → General Settings → Your Organisation). Any amendments made to the content of this message context will only be sent to the corresponding recipient (in this case the Primary Registrant) and will be used for all your events that are not using a custom message template. When using custom message templates, the same contexts also apply, the different here is where we edit these. For these we go to Event Espresso -> Messages. Custom Message Templates Tab. The default context is currently the Event Admin, meaning any changes you make to the template that is initially displayed will only be sent to the Event Admin, although again you can switch using the Switch Recipient button. Be sure to check the context of the message you are editing.